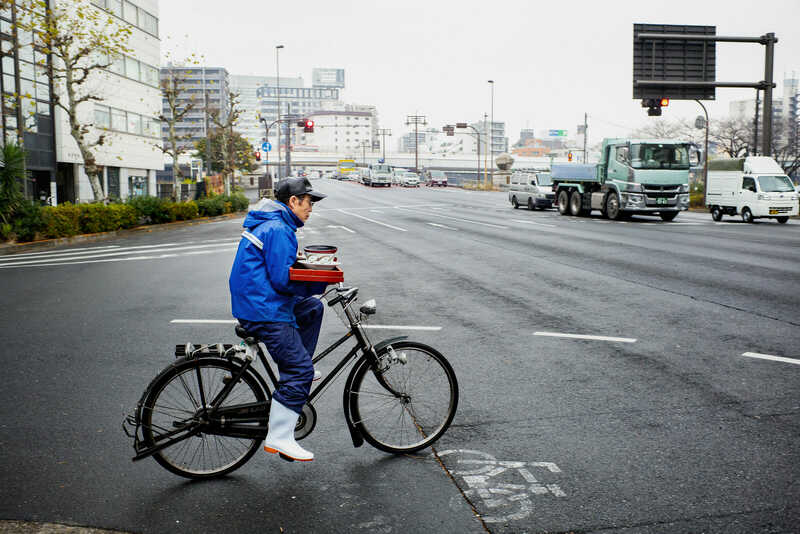 Modern delivery motorbikes or more old-school Honda Super Cubs are the standard method these days for quickly, and efficiently, transporting meals around the capital. Now and again, however, it is still possible to see how things used to be done. He certainly is. Seen a few fellas delivering food like this over the years, and their skill and balance never ceases to amaze. They look so comfortable too, whereas most other people would be anything but. I love photographs like this that pick out a single moment in an ordinary life that sends your imagination flying backwards and forward through what that life might be. There is a contented mundaneness about the scene you have framed here. Likewise. A little reminder of how things were, and also how they sometimes still are. It was a cold November night, as I recall, and we drove past some small suburban station, probably on the Keio or Inokashira line, with its nondescript shõtengai or shopping street. The street was decorated, as such streets always are in autumn, with red and yellow plastic leaves strung high along the shop-fronts, flapping and whirring in the bitter wind. Alan gazed at the scene in delight, and then said quietly, “Isn’t it wonderful? It’s so ordinary.” He invested the word “ordinary” with an extraordinary depth and significance. I really pay respect to him.Here they are calling you to get down on the street to collect your food no matter on which floor you are on.Of course a big tip is expected. In rotten weather too. But nah, no tip. Being Japan, one wouldn’t be offered. And even if it was, it’d be refused.